When in Vegas, some people gamble, see shows, or do things they can't talk about after they leave. Me? I paint. I leave the gaudy strip of decadence behind and head out to Red Rock Canyon. It is a peaceful place with hiking trails, a fabulous visitor’s center, and plenty of places to stop and take in the scenery. As far as I’m concerned, it’s the hottest spot in Vegas. This trip, I only had about three hours of free time, so I passed on visiting one of my favorite places along the way, Cactus Joe’s (a story in itself), in favor of getting in as much painting time as possible. I stopped at a picnic area near the park entrance, tromped off the asphalt, and found a reasonably flat rock, where I set up my gear for painting. It was one of those perfect spring days: the first of the spring flowers were blooming and the crisp blue sky’s fluffy clouds cast dramatic shadows across the rusty monoliths that frame the canyon. The changing light was stunning, making my tummy tingle with joy. I was so wrapped up in watching the shadows change I forgot to take photos. 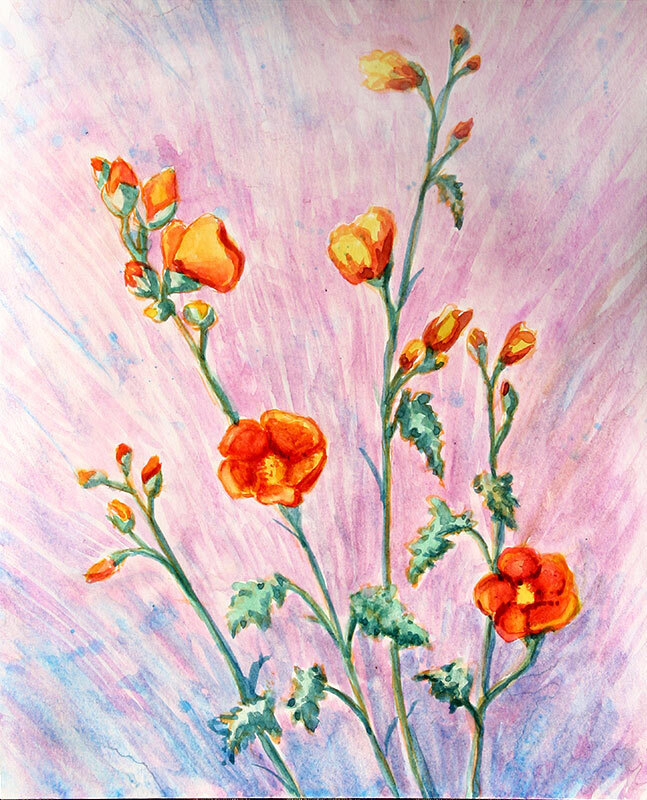 For my subject, I settled on a nearby Desert Mallow erupting with small, but brilliant orange blossoms. Most of the year, you wouldn’t give Mallow a second glance. The tightly crinkled dusty leaves, designed to hold on to every bit of moisture, aren’t much to look at. However, in early spring, while there is still moisture left in the ground from winter, they unfurl and soften—just a little—complementing the blooms that bob in the breeze. The flowers are an airy and delicate contrast to the sparse stems and leaves. Spring is slow to come to Wrightwood. Though the apple trees are blooming and the daffodils are about done, Mother Nature can throw us a snowstorm without warning just to humble us. In early spring, I crave blossoms and budding sprouts of lime green. This is a departure from my usual subject matter. Though I love old, broken down buildings, I do not draw or paint them very often. Once, when I was in visiting my grandparents in Pennsylvania, I took dozens of photos of dilapidated barns and farmhouses. My grandpa finally said to me, "You know I could take you by some nice barns that aren't all worn out if you want some good photos." "No, Papa. That's OK. I like the old ones." This piece is a mix of watercolor, acrylic, and colored pencil—and yes, I used opaque white. It's a small piece, so I needed the pencil to help capture the detail and the white paint for contrast against the warm weathered brick and stone. 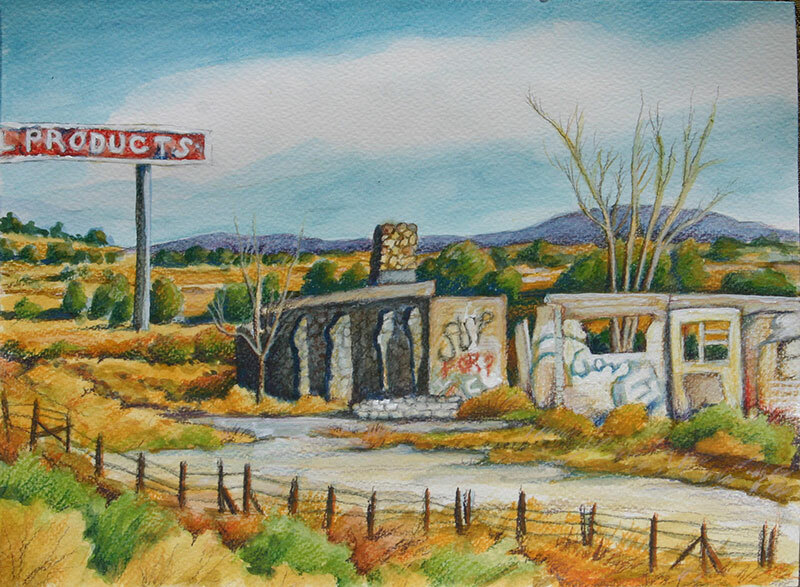 It is an old Standard Oil gas station on Highway 160 at Cow Springs on the Navaho Nation. I tried to find out more about it, but all I found were a bajillion photos of the ruins taken over the years by people on their way somewhere else. Some day I'd like to stop and look around rather than frantically snapping photos while whizzing by at 65 mph. We too, were on our way to Colorado, racing against the daylight, so there was no stopping for photos. Like this old station, I'm at a crossroads once again, not sure where I want to go next with my art. We were planning a camping trip where I hoped to get some plein air* painting in, but we had to cancel it. Sigh. I get some of my greatest inspiration on our trips to the wide-open spaces. However, I have plenty of images for inspiration right here at home. And some lovely creamy printmaking paper that is begging me to take another run at monoprinting. I’m thinking about what I might do with some sepia ink and that yummy paper…if only I could go up to the studio right now. * We do have a road trip planned in the near future where I hope to spend time sitting in the dirt with my watercolors.